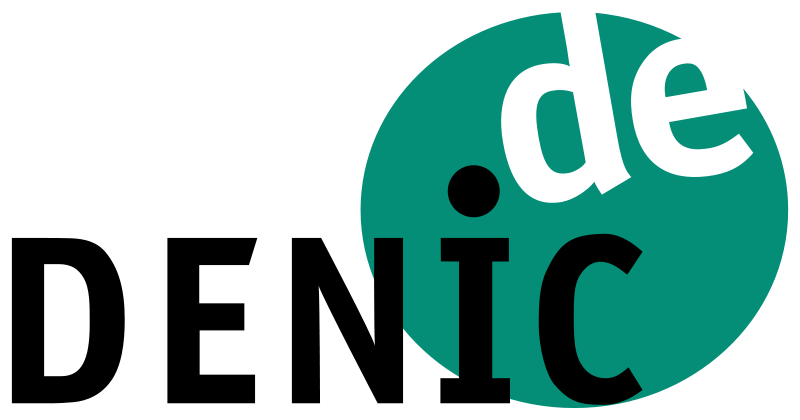 .DE is the official country code Top-Level-Domain (ccTLD) of Germany (Deutschland). A .DE Domain is normally used by companies or private entities who are located in Germany. The registrant or the administrative contact must be located in Germany (DE). Please note that you're only allowed to delete .DE domains if you have the authorization of the domain owner. Configured nameservers are required. A web based ZoneCheck is available. If you do not have your own nameservers, you have got the possibility to use an NS-Entry. Nameserver-Refresh: Please note that the DENIC ROOT Nameservers will be refreshed every uneven hour at half past. or whether the domain is to be deleted. This procedure ensures that the rights of domain holders to their domains are safeguarded. If you should ever receive an Email from our system telling you that the the respective domain name is in a DISPUTE you should contact the DENIC-Legal Department for further information. They will provide you with the information you need for removing the so-called DISPUTE-ENTRY. But please note that DENIC will only communicate with the ADMIN or with the Domain OWNER who is listed in the public whois-database. More Information: Even if DENIC does not become involved in pending disputes about domains, it can do something for you by placing a DISPUTE entry on the disputed domain. The main effect of this instrument is that the domain holder loses the right to transfer the domain to someone else, which prevents them from trying to shirk away from sorting the matter out with you. The only feasible transfer of the domain is to you and that, of course, remains possible. The DISPUTE entry made on the domain in your favour also guarantees that you will instantly become its holder if the existing holder deletes it. That is particularly advantageous for you, since the highest German court has ruled that an adversary may file for a court to order a domain holder to delete a domain but it cannot file for an order to transfer it. If there is a DISPUTE entry on the domain in your name, then it is enough for you to file for deletion and, thanks to the DISPUTE-entry mechanism, you are sure that you will then become the domain holder yourself. For this purpose, it is essential that the form applying for a DISPUTE entry also specifies the person who will become your administrative contact should such a case arise. This will accelerate the clearing procedure later on. Length: The AuthInfo must be 8 to 16 characters long. This is to avoid characters that are frequently mixed up..
As from December 2008, DENIC and the DENIC members offered a new procedure to domain holders who want to change their provider. The central feature of this new procedure is the transmission of a password, which is called AuthInfo. The AuthInfo is valid exclusively for this specific action and is related to one specific domain. Two steps are required to be able to apply the procedure: First, the domain holder must request his/her provider to obtain an AuthInfo, which is then stored with DENIC. Then he/she starts a provider change with his/her new provider. Below you find a detailed description of these two steps. To actually start the provider change, the domain holder communicates the AuthInfo to his/her new provider. The new provider, or more precisely the DENIC member administering the domain, can check with DENIC whether an AuthInfo has been stored (of cause without giving the actual character set of the AuthInfo). If an AuthInfo has been stored, the provider change request can then be transmitted to DENIC together with this AuthInfo. When DENIC receives the provider change request, it checks first of all if a valid AuthInfo has been stored for the stated domain. If an AuthInfo exists and it matches the transmitted AuthInfo, the provider change is carried out immediately and the AuthInfo used for it is deleted. If the password is invalid, the provider change is rejected and the new provider is informed accordingly. If no AuthInfo is stored for the domain, the domain holder must contact his/her previous provider to clarify why no AuthInfo has been stored. An AuthInfo enables a domain holder to carry out a holder change together with the provider change. This option is not available, however, if provisions to the contrary like an active DISPUTE apply. This distinguishes the new procedure from the asynchronous one, which only provides for a separate holder change. Other domain administration processes like updating the domain data or deletions cannot be executed by means of an AuthInfo. It is also possible to explicitly set or remove an AuthInfo1 code for a domain name. The AuthInfo2 code will be generated at DENIC. The DENIC sends a letter with the code to the registrant of the domain by post. A DENIC letter containing a AuthInfo2 code normally looks like this: DENIC AuthInfo2 letter. Please note that requesting an Authinfo2 code is not free of charge! Please note that when a .DE Domain is transferred successfully, then the registration period starts from the beginning. This page was last modified on 26 May 2016, at 21:44.